Process: I wanted to do something that spoke to one of the things that means a great deal to me, music. 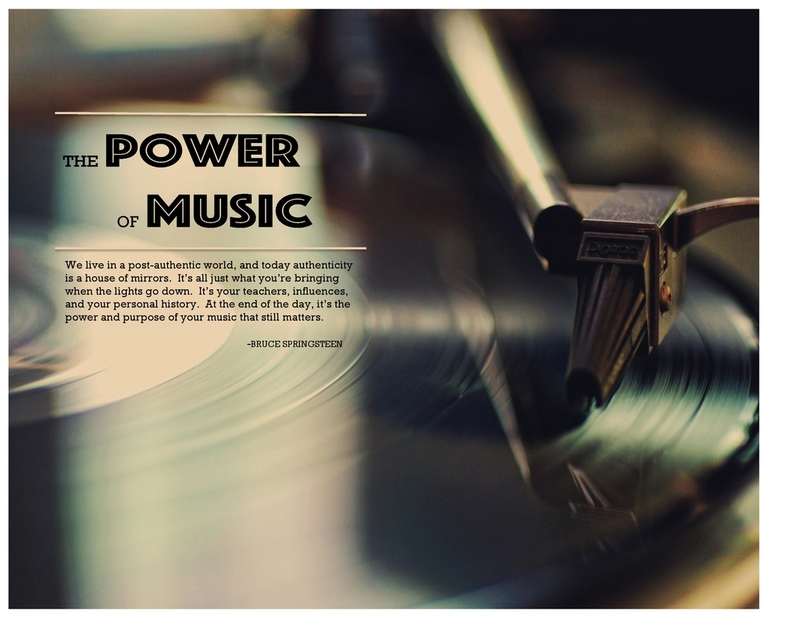 My idea was to be a reminder that music can be such a powerful force in our lives. My audience was my classmates, and ultimately anyone in this universe that has possibly forgotten their love of music. I imported my image into Word, arranged and resized it to fit the size criteria. I decided to keep the title in its own box, and then have the text separate. I ended needing to use some kerning to make the title look more appealing to the eye. After I completed work on the project I exported it as a PDF. I then saved it as a JPEG using the online converter. One suggestion I got from a friend that does Graphic Design professionally was to change the font for The Groove to something less serous, and more try for something more playful. I used that design help on this project. A few classmates shared that sentiment. Most of them liked the design idea so I took their input and found an image and a quote that fit the bill. I found this graphic very appealing. I am from the days of vinyl records. So that graphic caught my attention right away. The title really stands out in the font you chose. The quote from Springsteen is awesome. Excellent job Chris! I especially enjoyed the texture around your title. It is an eyecatching focal point. I’m also in agreement that music plays a vital role in our lives. The quote you featured from Bruce Springsteen, brought wonderful memories of the musics that has touched my life. Well done. Here is a link back to my blog. Hello there, first of all I’d like to say I like what you decided to do for your project, it looks nice and neat and I think the font types flow nicely with the picture. I think it works well that the text fits inside the lighter space, providing a good contrast. So nice work!